For a long period it was a rule of thumb that Mendelssohn’s music had suffered a steady decline from the early masterpieces such as the Octet, and the Overtures to the Midsummer’s Night Dream and the Hebrides. If ever a work proved the critics wrong it is the Violin Concerto, op.64. The Concerto was completed in 1844, three years before the composer’s death, and was first performed in Leipzig by Ferdinand David with the Gewandhaus Orchestra in the following year. Interestingly the Danish composer Niels Gade conducted. David wrote to the composer that ‘[the concerto] fulfils all the demands one can make of a violin concerto … violinists cannot be too grateful to you for this gift.’ It has remained a favourite with audiences ever since. The secret of the work’s popularity is its vigour, the serenity of the slow movement and technical display which avoids sheer virtuosity simply for the sake of being difficult. Joachim once wrote that ‘the Germans have four violin concertos. The greatest, most uncompromising is Beethoven's. The one by Brahms vies with it in seriousness. The richest, the most seductive, was written by Max Bruch. But the most inward, the heart's jewel, is Mendelssohn's’. At present (January 2016) there are some 204 recordings of Mendelssohn’s Violin Concerto listed in the Arkiv catalogue. Any attempt to provide a detailed comparison between versions of the concerto will be doomed to failure. From a personal point of view, I was introduced to this work by way of an old vinyl version of Isaac Stern and the Philadelphia Orchestra conducted by Eugene Ormandy, released in 1959. Since that time, I have enjoyed recordings and concerts of the concerto by Yehudi Menuhin, Jascha Heifetz, Nigel Kennedy and Nicola Benedetti and others. Jennifer Pike’s interpretation is dramatic, passionate and always nuanced. The violin tone is well-rounded and perfectly balances vivacity with deep intimacy in the progress of the concerto. It impressed and moved me. This performance is certain to become one of the great standard recordings. Another work that defied Mendelssohn’s critics is the incidental music to William Shakespeare’s fairy play, A Midsummer Night’s Dream. From the first note of the Overture to the last of the ‘Finale’, this music matches the wit, magic, frivolity and subtlety of the play. In 1842 Mendelssohn was commissioned to write the incidental music for Karl Wilhelm Friedrich Schlegel’s German translation of the play. Not unnaturally, Mendelssohn recycled the early overture written in 1826 when he was only 17 years old. He used this as the inspiration for the following 13 numbers. Six of these are simply ‘melodramatic’ mood pieces designed to underscore spoken texts: they are omitted from this recording. It leaves the eight sections recorded here. This includes the hackneyed, but well-written ‘Wedding March’, the ‘Scherzo’, ‘The Dance of the Clowns’, and the ‘Nocturne’. For me it is always a joy and a pleasure to hear this music. In the present recording all the dreamlike atmosphere is present and correct. I was particularly impressed with the beautiful Song ‘Ye Spotted Snakes’ with its Sullivan-esque chorus. This masterly performance of these two essential orchestral works were recorded in the iconic Town Hall in Birmingham, where masterpieces such as Elgar’s The Dream of Gerontius and Mendelssohn’s Elijah received their premieres. Arthur Sullivan, The Beatles and Bob Dylan have graced the venue with their artistry. The City of Birmingham Symphony Orchestra is directed here by their guest conductor Edward Gardner. Jennifer Pike needs little introduction to enthusiasts of the violin. Her career was launched 13 years ago in Lichfield Cathedral with the present concerto. Last year (2015) she made her debut at the Carnegie Hall, New York with Vaughan Williams’ The Lark Ascending; she received a standing ovation. For Chandos, Pike has recorded a wide range of music including Sibelius’ Violin Concerto, Sonatas by Franck, Debussy, Ravel, Janacek, Brahms and Schumann as well as concerted music by Miklós Rózsa and Ernest Chausson. She has, in all cases, received excellent reviews. The present volume has dispensed with the pen sketch by the composer featured in the last three issues, which is a pity. The liner-notes, (in English, German and French) by Bayan Northcott are extensive and discuss the works in detail: the booklet also includes Gerald Larner’s essay-length article on Mendelssohn and his relationship with Birmingham. The usual biographical details of the soloists, the orchestra, chorus and conductor are given. 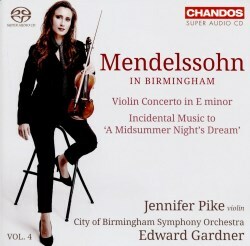 This latest release in Chandos’ ‘Mendelssohn in Birmingham’ line is, as noted, the fourth volume in that series (vol. 1; vol. 2; vol. 3). So far, it has featured all the Symphonies and a good selection of the overtures. The present CD features one of the best known and loved violin concertos in the repertoire and the incidental music to Shakespeare’s magical play, A Midsummer Night’s Dream. I thoroughly enjoyed everything about this disc: the outstanding playing of soloist and the orchestra, the superb quality of the recording and the first-rate documentation provided in the liner notes.